Wide White has been developed specifically to aid in restoring and beautifying wide whitewalls. This cleaner is safe to use on both black and white rubber and is made from environmentally friendly ingredients. It will restore your whitewalls to their snowy white luster. Big Classic has been formulated to give your tires a beautiful black finish without excess gloss. It is a non-silicone based dressing that now includes a UV protectant, making it great to use on both black and white rubber. 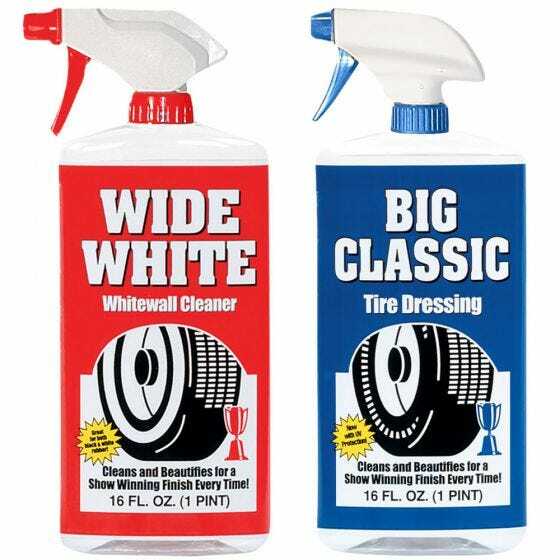 Use Wide White and Big Classic in combination for your show car detailing! We suggest our Big Classic Tire Dressing as included in the tire cleaner package! You may also use Simple Green. We encourage the use of citrus based cleaning products and recommend that you avoid anything containing bleach or silicone in the ingredients.